Today I spun up 100% Cormo fiber from Foxhill Farm. 64 yards n-ply. Cormo is a favorite of mine to spin. If you are a spinner and have not yet spun this wool, then make sure to try it out sometime. You won’t regret it! 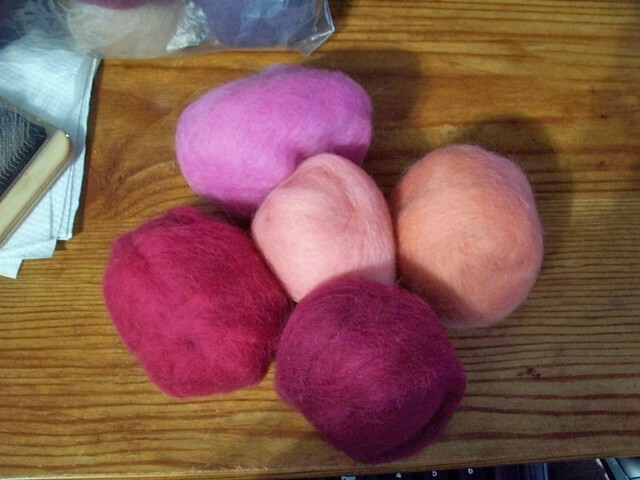 Tour de Fleece – Finished! At the beginning of the month, July 6th to be exact, part of my spinning wheel broke. I contacted MerlinTree for a replacement part and he said he’d send it right away…except I was having issues with my email which caused a delay. I did not get the part until this past Saturday, late afternoon. I immediately changed out the broken part and then spun like a crazy lady for the rest of Saturday all day yesterday. I lost two weeks of spinning but I wasn’t going down without a fight! Here are the yarns I managed to spin up Saturday and yesterday. I finished the last one at 11:45pm! 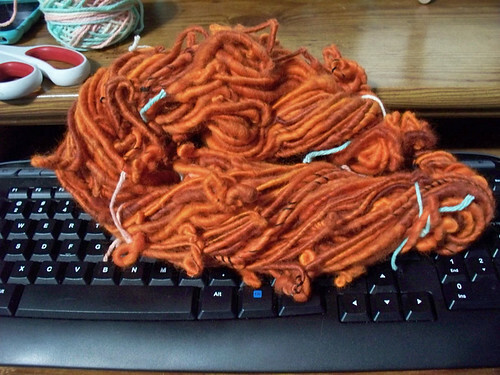 While I was spinning, I was putting finished skeins into a bin I had picked up for my craft area. When I took all the skeins out to take a group shot, my cat immediately jumped into it. Here is the group shot of all the yarn I spun up in a little over a week. I spun up a total of 3.69 lbs (pounds!) of fiber. I won’t know yardage until I wash all the skeins. I don’t know when I’ll do that. 16 Skeins of yarn, 3.69lbs of fiber spun. 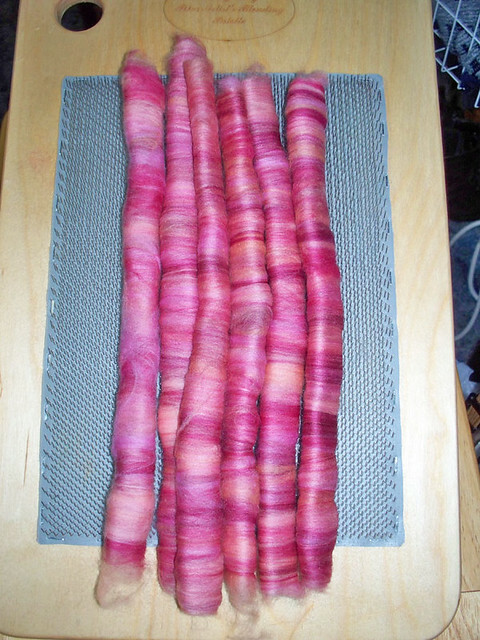 I am already looking forward to Spinzilla in October. Then the weekend after that is NY Sheep and Wool, a.k.a Rhinebeck. So I’ll get to restock up on fiber. Yay! While I am still waiting on the part for my wheel (apparently there was a mishap with the email so he never got my address), I picked up this pretty Hokett tapestry loom when I went to Webs the other day. I’ve tried to do tapestry before on my Cricket, but a rigid heddle is just not meant to hold high enough tension, and the angle is wrong. I got this little loom to play around with. I also have a Mirrix Big Sister (16″) on order that should be here tomorrow. I started weaving with scraps of acrylic and my handspun. I really did not like the look of the acrylic so I unwove it. I decided to just use my handspun. I’m not too far yet, but here’s what I got so far. My simple tapestry so far. I can’t wait until my Mirrix arrives. I’ve wanted one for awhile now and ordered it for myself for my birthday present. I also ordered a tapestry kit and bought the class that goes with it, so I’ll be doing that. Hopefully the part to my wheel will be in early next week (maybe Saturday if it gets shipped out today). I really am sad at missing so many days of spinning, but my spindles are just killing my shoulder so I can’t spin at all. At least I got some things done up, so I’m happy with that. Like last year, this year I am on three teams for the tour: Team Webs, Team Merlin Tree, and Team Loop. I have a big stash of fiber so it’s always hard to choose which I am going to spin first. 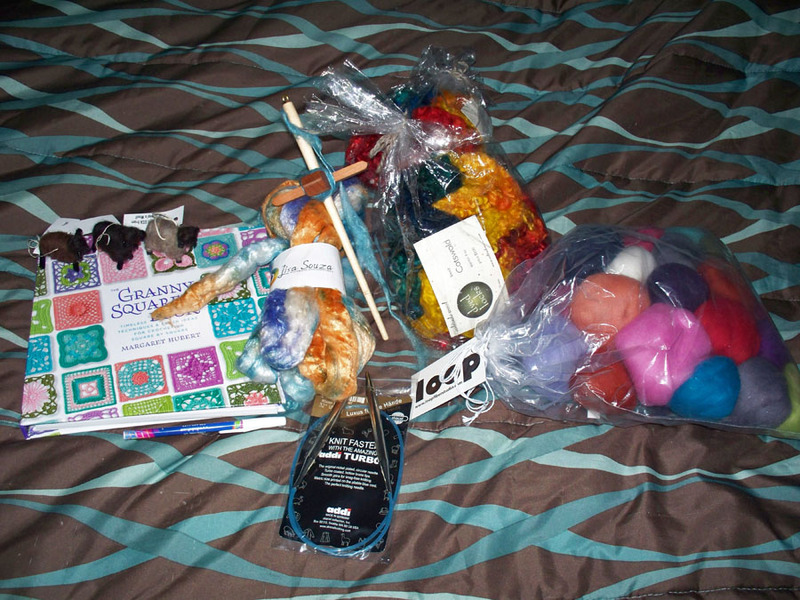 Last year I was subscribed to Spinning Box, which is a great subscription based product where you get sent samples from various venders, plus the main vendor Camaj fiber arts. I did a six month subscription but had not spun any of it yet. So I decided to spin up these boxes to start. The first one I grabbed was from last August which was ocean themed (each month is themed). I wanted to spin the larger colorway from Camaj seperatly, but wasn’t sure about the rest. I decided to just spin them all one after the other and then ply it together and see what I got. I’m not sure what I think of the final product of that bunch, but I love how the Camaj spun up on it’s own. 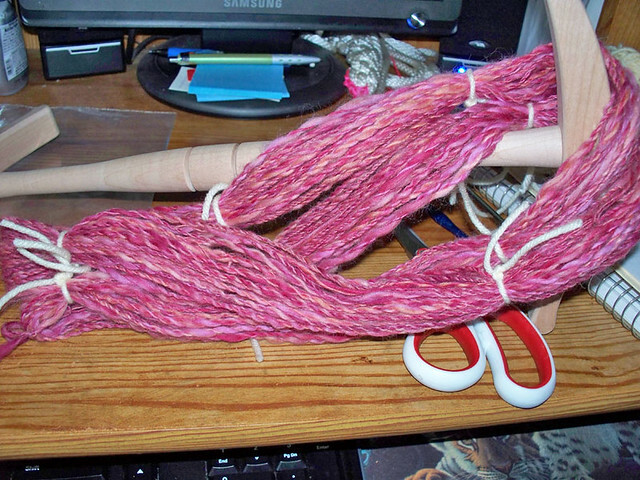 This is all the others plied together. 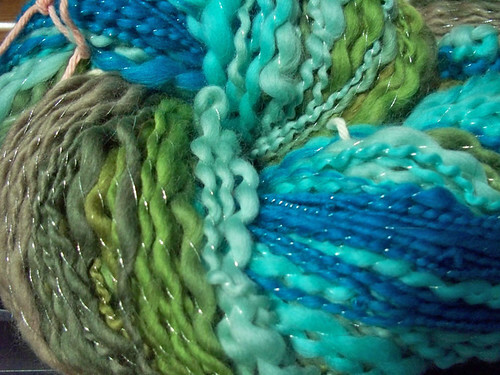 This is the colorway “Sea Nymph” created by Camaj. I love, love, love how it spun up! I have not set the twist yet so don’t have a yardage for them right now. Together, they weigh just under 10oz. I don’t know which box I will be doing next, or if I’ll do a Loop bump next instead. We’ll see! Over the holiday I have been working on my fiber related projects. I took stock of all of my fiber and uploaded them in to my stash on Ravelry so I can keep track of what I have. It also makes it easier to add to my projects when I list them. I got a gift card to Webs from my coworker for Christmas as well as a gift card from my parents and grandparents. 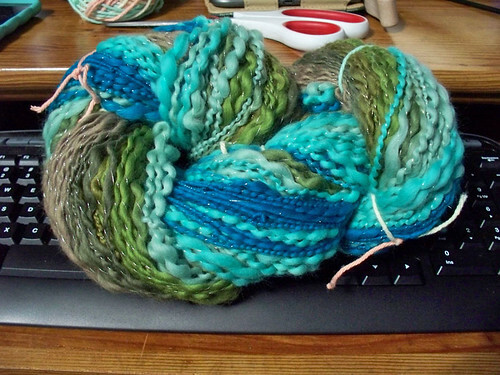 I will be going down soon to stalk up on more fiber and to hopefully get some weaving yarn. Rolags from mystery fiber. Hard to tell in the picture, but they are black and purple. I spun this up and plied it with silver metallic thread. It is Loops December Bullseye of the Month Club “River Safari”. This is my first time spinning one of her bullseye bumps. I really enjoy watching the colors spin up as I get to them. I am looking forward to the next mystery bump! This one was a double experiment. 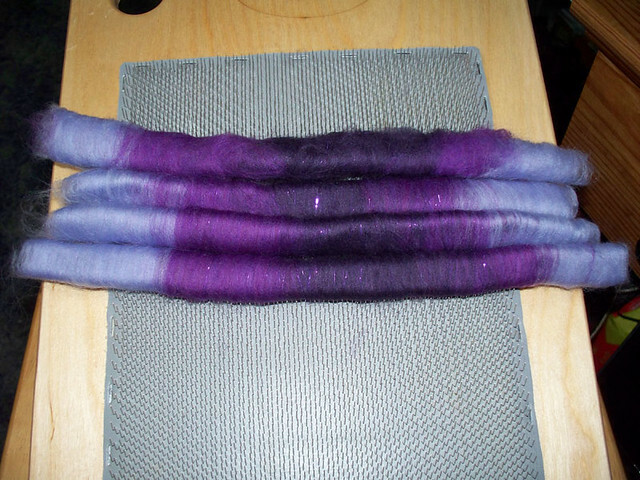 I have never spun Polworth before or tried corespinning. I really dislike the Polworth. It is very “sticky” and hard to draft. I had to stop constantly and pre-draft. This was intentionally spun thick for weaving with. And a few projects I made earlier in the year but I don’t think I ever posted about. 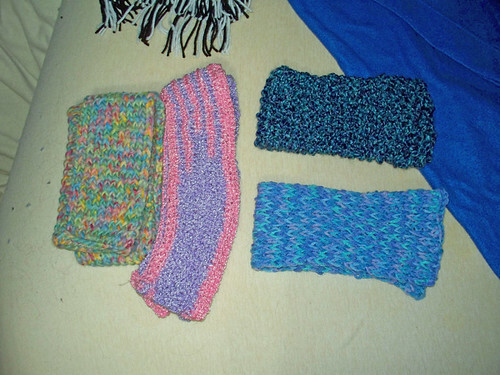 Nothing interesting really, just some basic scarves and ear warmers. 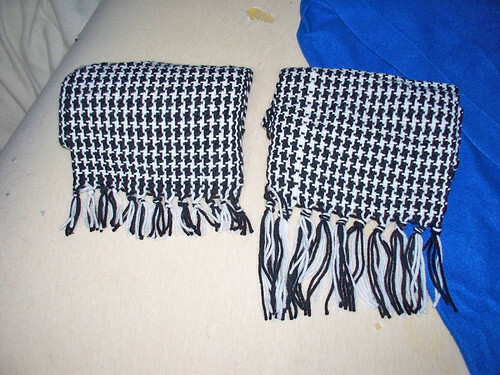 The two black and white houndstooth scarves are woven. The others are knit. And aside from those, I have been making cotton wash cloths. No pictures of them yet, but I have a mountain of them. I’m trying to use up the small balls of Peaches n’ Cream I’ve had for a few years before buying new yarn. So that’s what I’ve been doing! I hope everyone else had a nice Christmas and holiday. Now that I had some fun fiber to play with that I purchased at NY Sheep and Wool, I ordered myself a blending board from Fancy Kitty. I only had to wait two days before I had it in my hands and I started playing with it that night. 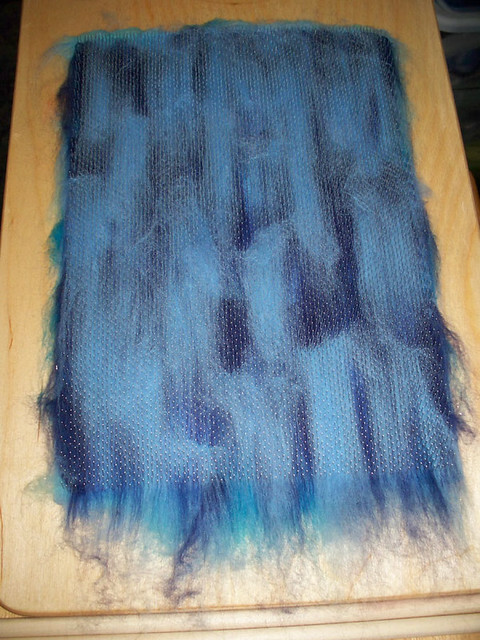 Blending boards are great for mixing fibers and making your own rolags or mini batts from for spinning. Here is what I have made so far. Now I just need to find projects that will work with what I’m mixing and spinning up. Either way, I’m having a blast with fiber. Last weekend I got more too. This time I went to the New England Fiber Festival. I got some new fiber to try out. Can’t wait to get started. Can’t decide which I want to do first! The white fiber is cormo and so soft! To the left of that in the bag is sari silk. The blue/purple mix under the cormo is alpaca, also super soft, and the red/orange braid is polworth. I’ve never spun any of them so we’ll see how it goes. The two heddles on the left are for my Cricket loom, an early Christmas present so I can weave now. I’ve only had the one heddle since I got my loom a couple years ago. Now I can do thinner and thicker yarns! 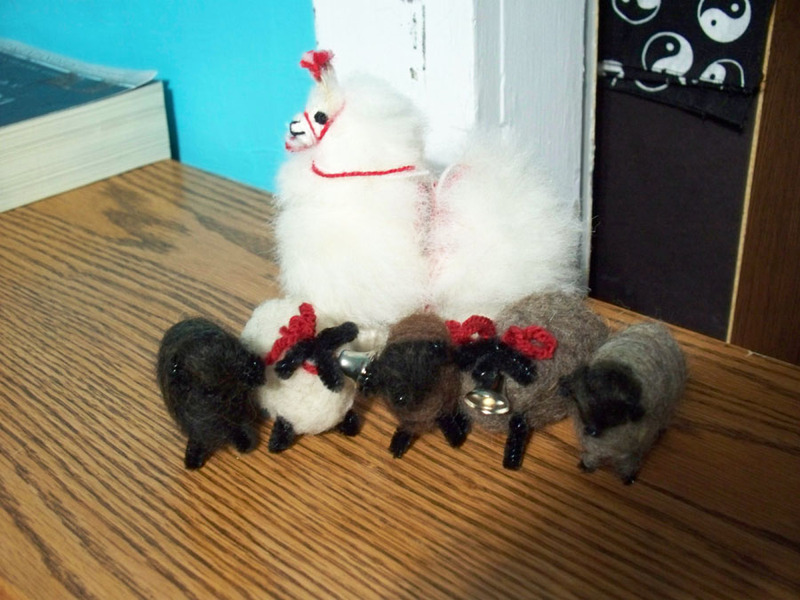 Yesterday I went to the NY Sheep and Wool festival in Rhinebeck, NY. My mother and I went via bus that left from a local yarn store. We left the lot at 7am and arrived around 10am. There was a sea of cars parked in the lots and I was happy that we did not drive ourselves because trying to find our car after would have been like trying to find a needle in a haystack! We made sure to pick up the program book that had a map as well as the times for events, workshops and a long list of vendors. There were around 200 vendors there so we saw some of everything. It was a constant stream of ‘oooh’ and ‘aaahs’ coming from us as well as the other visitors. The vendors were nice and very helpful, as well as some of the visitors if they heard you talking about something. 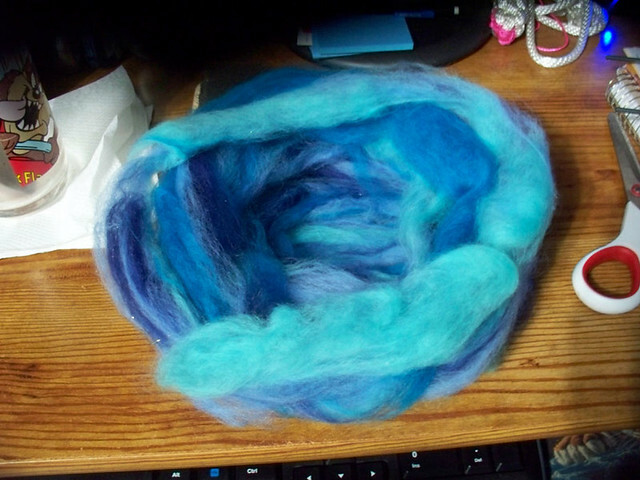 2) 4oz of Merino/Silk roving from Lisa Souza in the Bird of Paradise colorway. This is the first thing I bought. I could have gone crazy in her stall because everything there was beautiful. I did not want to spend all my money in the first building though! 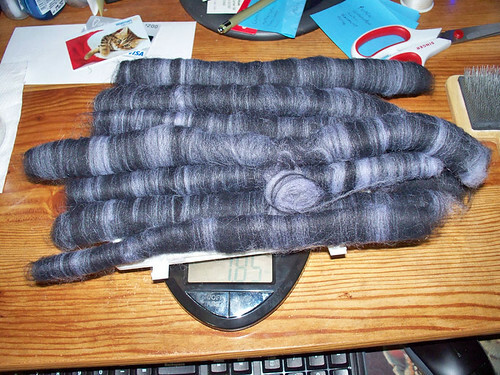 4) Two bags of Cotswold curls to spin with. I’ve always wanted to try and they are very pretty. From Solitude Wool. 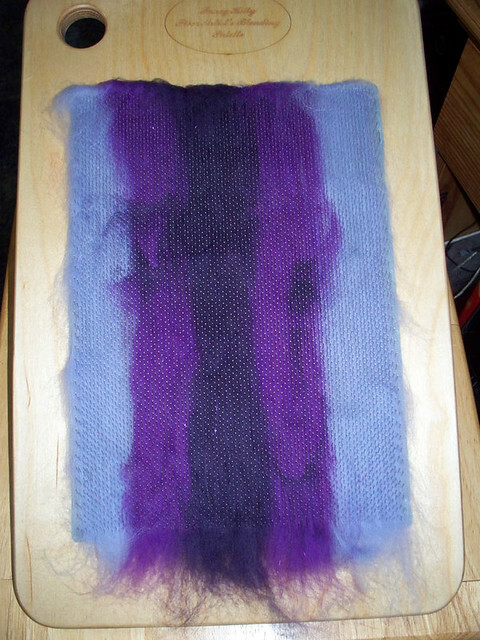 5) One back of mixed rainbow fiber to card with so I can make my own batts/rolags. (I’ll be getting a blending board this week) from loop. 7) The Granny Square Book by Margaret Hubert. This woman was at the table with the books signing them. She signed the copy I bought for me. She also gave me a mini lesson as I am a beginner (just talking, not showing since neither of us had the supplies for it). She is extreamly nice and pleasant. She also said that if I had questions on anything that I could email her and she’d help me out. How many people do you know would do that? So yeah, she’s a sweetheart. 8) I contacted Dave at The Merlin Tree where I got my Roadbug. I wanted to get a jumbo flyer and bobbins because the normal ones are too small (fill up too fast). He said that they were currently discontinued because he is working on a new model which will be out the end of January. He then said that he had one left of the current one and said that he would bring it to Rhinebeck for me. So I purchased that and an extra bobbin from him (because I don’t want to wait until Jan!) and he was, as always, a pleasure to deal with. If you are looking for a great wheel that is inexpensive, then I highly recommend checking out The Merlin Tree. I saw beautiful African baskets and the man who was making them. I really wanted to get one but I do not have the room for one at this time. Someone was kind enough to give me a link to the online shop where I could buy one later. I already have a few picked out. The crowds were insane and some of the booths had long lines waiting to pay for their purchases, so we skipped some of the booths. We also skipped the wine and cheese tasking because the lines there were just as crazy. All in all, I had a fantastic time with my mother at Rhinebeck and I would love to go again next year. Craftster a place for people who do crafts of all types. You can find free patterns here too! Etsy A place to buy and sell all things handmade.